This past week second and third grade students at my school are learning about measurement. The students are making progress. The classes have become more fluent with understanding perimeter and area, and are now starting to explore the concept of volume. Throughout the process students have used various manipulatives, such as prisms and nets to deepen mathematical understanding. Even with all the activities some students that are still struggling with the concept of volume. In about three weeks or so students will be assessed on this particular topic. Providing extra sessions for students to develop a conceptual understanding of volume is important. I wanted to find or create a math task that gave students intentional time to review geometry and measurement terms, while at the same time allow opportunities for students to create different products. After reviewing different options I decided on having students use the project detailed below. Students were given a full sheet of colored centimeter graph paper. They were then asked to read through the directions. Directions: Create a net for a rectangular prism using the graph paper provided. The rectangular prism you build should have a volume of 20 cm3. 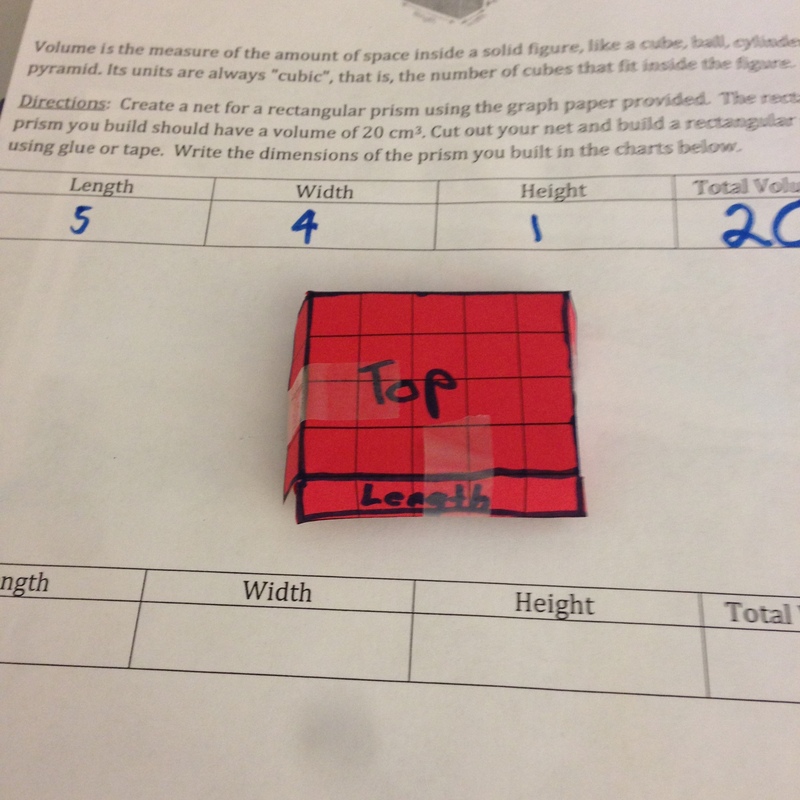 Cut out your net and build a rectangular prism using glue or tape. Write the dimensions of the prism you built in the charts below. Looking back, it seems like there were more than enough questions about what was expected. Students always seem to have questions when there are multiple solutions/products. After I answered their questions I took about 10 minutes to model the activity with the students. This was important as it cleared up expectations for the activity. I then passed out the assignment. Students then used the centimeter grid paper to create a rectangular prism net. They then filled out the top portion of the sheet. Some students had to use multiple attempts to create a net with a volume of 20 cubic centimeters. This was great opportunity for students to show perseverance and find a solution that worked. I went around the classroom and asked students questions to help them think of a solution. The students then cut out the nets and constructed their prisms. The students then presented their rectangular prisms to the class. How do you construct meaning in geometry? Reblogged this on Joining the dots.